Over the past 10 years, two players in the world have been better than the current version of Cristiano Ronaldo: Lionel Messi and the previous version of Cristiano Ronaldo. Inevitably, all of Ronaldo’s achievements get held up against Messi, and that’s unfair because, well, comparing Lionel Messi to anyone is unfair. Instead, the more telling and more apt comparison is between the player Cristiano Ronaldo once was and the one he now is. Whenever Ronaldo retires, he’ll go down as one of the best players we’ve ever seen. He has a list of records and accomplishments that compares with that of almost anybody1 who’s ever played the game, along with a physique and hair-gel game to surpass them all. Once the world’s best winger (who could also score like a striker), he’s since turned into the world’s best pure striker (who can still break you down on the wing if he really needs to). That might seem like a small shift, but the tweaks to his game have allowed the Portuguese superstar to focus on scoring goals while preserving a body that still looks like it’s immune to the progression of time. Sprinting down the sideline and hurdling tackles is for the kids. Peeling off the back shoulder to nod the ball home from point-blank range? That’s a game that knows no age. Think of Ronaldo and a few things immediately come to mind: the towering figure brooding over a pending free kick. The twirling jump and thumping landing after he scores. But the iconic Ronaldo image remains the step-over. Hell, it even has its own kind of urban legend. The broad outlines of each one are the same: He slows down, and you can almost instantly feel the dread soaking the poor defender. Only Ronaldo knows where he’s going, and suddenly it’s a helicopter of in-and-out. Either the defender dives in and he’s toast, or the stop and start is enough for Ronaldo to freeze his marker for just long enough to allow him to blow by. Then he’s off, skipping away into the space he needs to shoot, cross, or dice up another hapless opponent. However, it took Ronaldo a few years to develop into that unguardable and devastating force. He and his step-overs arrived at United in the summer of 2003 from Sporting Lisbon. As the story goes, he was so convinced he was immediately going to be loaned back to his Portuguese team that he didn’t even bring a change of clothes to England. Yet, on August 16, 2003, he made his Manchester United debut at 18. For the next three seasons, Ronaldo functioned primarily as a tricky and athletic-but-slight winger. In his first 95 games across three Premier League seasons, he scored a modest 18 goals. Then, in 2006-07, Ronaldo, who’d been growing stronger by the season, made the superstar leap. He led the Premier League in assists with 14, and a year later he led the league with 31 goals. 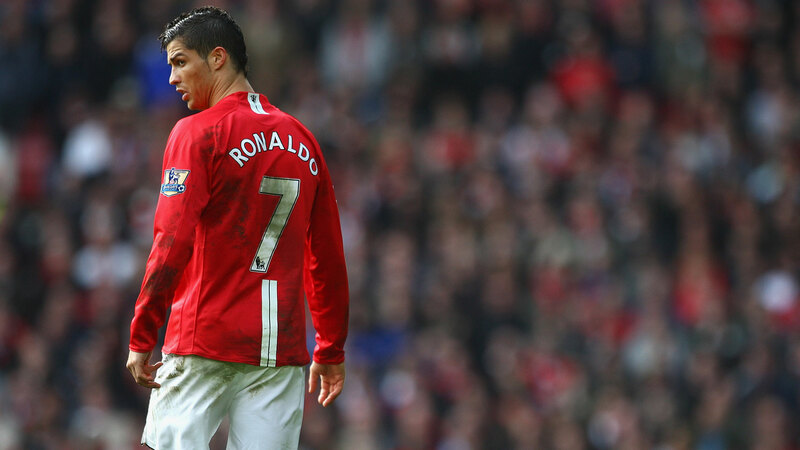 Under Sir Alex Ferguson, that 2007-08 team provided the ideal platform for the world-conquering force Ronaldo had become. He featured alongside Carlos Tevez and Wayne Rooney in an interchanging and unconventional front line that devastated opponents. United won the Premier League title and the Champions League amid a slew of gorgeous goals from fluid buildup play. Much of Ronaldo’s sudden and amazing goal-scoring surge came down to this: He was empowered to play both like a forward and like a winger. At the time, Ronaldo was so dominant on the ball — and so effectively flamboyant — that all the highlight-reel stuff overshadowed just how frequently he showed up at the net to finish off someone else’s pass. Score enough screamers from 40 yards and people will forget how often you pop up at the right time to get on the end of the havoc caused by Tevez and Rooney. In the first few years, the only real difference between United Ronaldo and Madrid Ronaldo was in how he was being used. Instead of moving him all over the attacking third, managers Manuel Pellegrini and then Jose Mourinho focused solely on weaponizing Ronaldo on the left wing. Yet the lack of positional freedom didn’t change the way Ronaldo operated. He either terrorized the wing, creating shots for himself and strikers Karim Benzema and Gonzalo Higuaín, or he functioned as Mesut Özil’s back-post muse, showing up in the box over and over again to finish off his attacking midfielder’s crosses and through balls. That Cristiano Ronaldo — the one who would light a fullback on fire and poach inside the 6-yard box — is gone. For starters, those iconic step-overs have dramatically declined over the past five years. In 2010-11,3 he tried 5.16 take-ons per 90 minutes. That figure went up to 5.27 the following season, but by last season it had dropped to 3.63, and it’s even lower this season at 3.39. Unsurprisingly, he’s also getting fouled less since he’s not crashing toward defenders and they aren’t forced to kick his ankles as a last (or sometimes first) resort.4 His general involvement is down, too. In each of the past five seasons, his touches have declined, dropping from 58.01 in 2010-11 to 49.97 last season and to 47.70 this season. His movement statistics tell a similar story. There’s no way around it — he just runs less with the ball at his feet than he used to. Michael Caley compiles stats using the distance between on-ball events5 to see which players move around the field the most with the ball. In Ronaldo’s first season in La Liga, he covered 385 yards with the ball at his feet per 90 minutes. Last season, that number had dropped all the way down to 228 yards per 90. That’s more than one and a half football fields worth of dribbling per game. When he came to Spain, nobody ran with the ball more than Ronaldo. By last season, not only was he outside the top 10, but teammates Isco, Luka Modric, and James Rodríguez were all ahead of him.6 The shift becomes even clearer when you look at the amount Ronaldo moves with the ball at his feet in the middle third of the field. In 2009, he averaged 136 yards per 90 minutes in the middle; that was fourth most in the league, and he was the only non-Barcelona player in the top seven. Last season, he was all the way down to 45th! No fewer than eight of his Real Madrid teammates moved more on the ball in the midfield last season. Over that same span, his on-ball movement in the final third has also dropped, as he’s gone from league leader at 230 yards per 90 to fourth at 148 yards. All of those distances and averages add up to something very simple: Cristiano Ronaldo is a much different player than he used to be. And yet he’s no less effective. You know what hasn’t dropped off? His scoring numbers — although they have changed slightly. Last season, Ronaldo took 5.91 non-penalty shots per 90. That’s fewer shots per 90 than he’s taken at any time in the past five seasons, but still more than any person not named Cristiano Ronaldo has taken over the same time period.7 Despite that drop, the 2014-15 edition of Ronaldo also had the second-highest non-penalty expected goals per 90 rate (0.81) he’s lodged over those five years. Why? His average shooting distance fell to 18.8 yards, the lowest it’s been since he arrived in Spain. The world of professional sports is littered with stars who couldn’t change as they got older. Just look at Fernando Torres’s time with Chelsea or the Rooney-shaped albatross currently weighing down Manchester United. Ronaldo’s ability and willingness to adjust is a legitimate revelation. He’s 30 years old and is nearing, or slightly past, what would normally be the physical peak of his career. When some players hit the age where their bodies no longer perform the way they once did, they simply cannot account for the inevitable loss of that half-step of speed. Instead, by conceding that he’s suffered some physical decline and therefore spending less time on the ball and more time near the goal, Ronaldo has adapted about as well as any athlete possibly could. Once upon a time, suggesting that Ronaldo needs good service from his teammates in order to thrive would have been sacrilege. Now, it’s a simple truth. In four league games this season, Ronaldo has scored five goals — and they all came in one game against Espanyol: a penalty and four point-blank finishes thanks to Ronaldo getting to the right places at the right times as guys like Gareth Bale and Benzema gave him the ball. Despite Ronaldo’s continued production over the past few years, there’s been some turmoil in Madrid. Bale, in particular, has been a lightning rod. As Madrid struggled through parts of last season, Bale, who has put up strong numbers since arriving in the capital, was blamed not only for the team’s underwhelming results, but specifically for Ronaldo’s intermittent stretches of poor form. The reality is that Ronaldo 1.0 began to slow down right about the time Bale came to town. For a year, it all worked and they won the Champions League, but by last season, it became clear that Bale and Ronaldo were not the pair of high-flying, narrow wingers that was initially envisioned behind Benzema. They were still deployed in those positions, though, which meant Bale was, in effect, playing to the side of two pure strikers in a decidedly lopsided system that imposed a heavy toll on the midfielders behind that skewed front three. It’s not that Bale and Ronaldo couldn’t play together; it’s just that they were being shoehorned into a system designed for a Ronaldo who no longer existed. In the end, that’s probably what cost manager Carlo Ancelotti his job. It’s sort of a fitting end to Ronaldo’s evolution, isn’t it? He burst onto the scene as a guy who could do anything with the ball at his feet. Defenses would bend toward his threat and spaces would open up for his teammates. Now, it’s his off-ball movement that accomplishes the same thing. With athletes who are as overtly physical and seemingly reliant on quickness as the young Ronaldo was, there’s always the lingering thought that their games just won’t age well. As we’re seeing with Rafael Nadal on the tennis court, when the quickness and force that your success is built upon goes away, what’s left? For Ronaldo, it’s the world-class movement and finishing that’s always been there but wasn’t always obvious. Now it is, and based on the past few years, there’s no reason to think it’s going away anytime soon. His 230 La Liga goals have already surpassed Raul’s club record of 228. The first year with ESPN Stats & Info data. In 2010-11, he was getting fouled at a rate of 2.59 times per 90 minutes. Last season, that had dropped to 1.60, and this season it stands at 1.21. In other words: the time while a player is dribbling. Gareth Bale and Toni Kroos were close behind at 203 yards per 90. Yes, that’s right. Ronaldo has the five highest shot volume seasons in ESPN Stats & Info’s La Liga database. In fact, he has the five highest totals of any domestic league that ESPN data tracks.